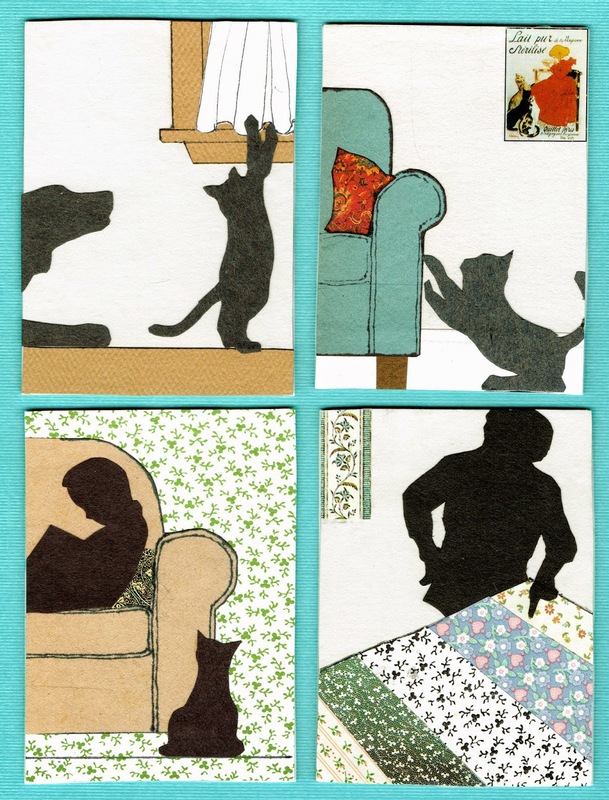 I want to share some wonderful ATCs made by my dear friend, Elaine. I was so thrilled when they arrived in my mailbox! and creates such natural scenes. "what do you think of this combination?" 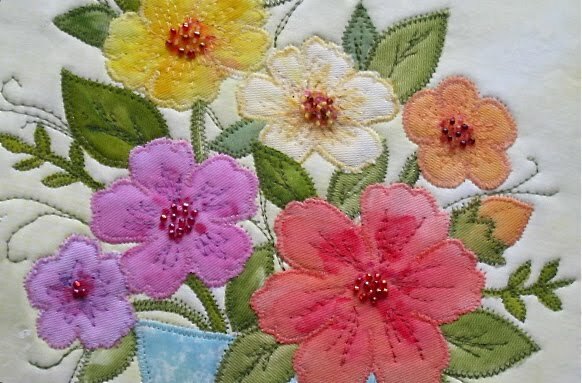 who shows more of Elaine's ATCs on her blog, Sew and Sow Life. 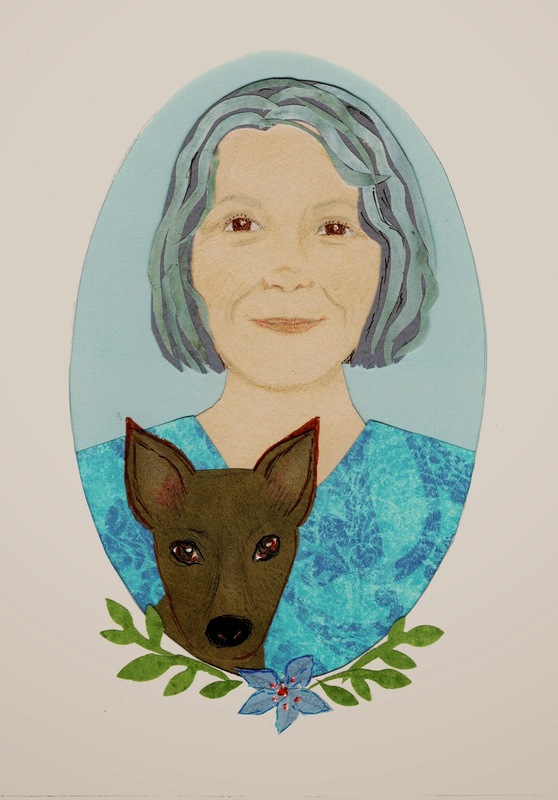 Thank you, Elaine, for the small treasures! post some of my projects soon. Hope you're having a terrific weekend!! this time taken from real life! and gardening in her back yard. is a happy escape for the members of her family. to all who know her. little girls, Carly and Angie. On the other side live her mother and dad. and while she works, her mom babysits. walked out on her and his beautiful girls. with her girls, her brothers and sisters, and nieces and nephews. Gina dances and plays with her girls. of the residents of Shady Elms Nursing Home. dull routine of the residents' lives. and the freckles that sprinkle over her nose. and wishes that she could be someone else. On Friday I did some wet felting and came up with this colorful piece! I thought the felt was very thin, so I decided to build it up a bit today. a few sections of color off. I teased the strands apart and arranged them on top of the original piece. 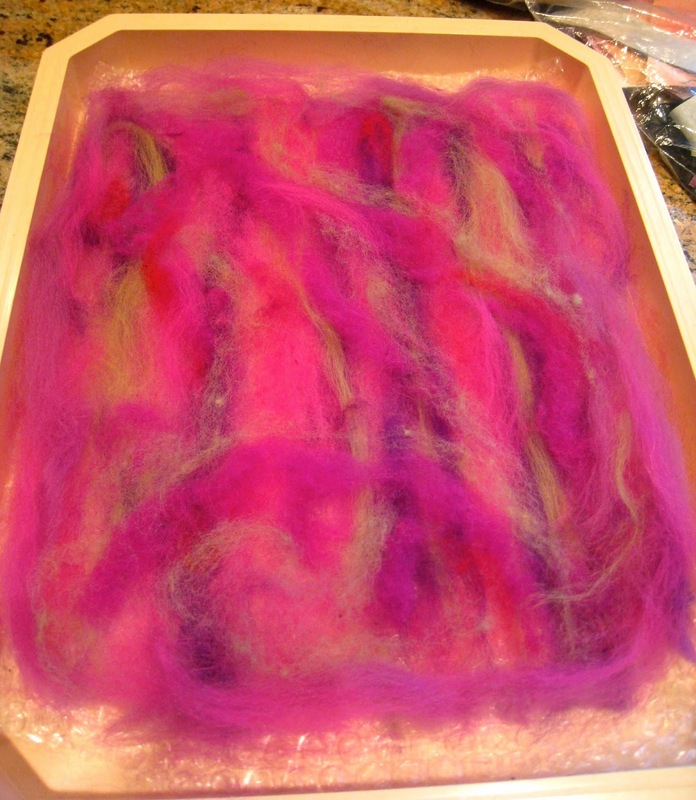 This was my result after wet felting - soaping, agitating and rinsing. and adding beads and other elements. a very freeing exercise for me. Love it!!! Hope you've had a terrific weekend!! which I finished recently for someone who is very dear to me. and to my own procrastination. I'm so happy to have completed it and sent it to its owner. a special meaning for its owner, and I was happy be able to do it. 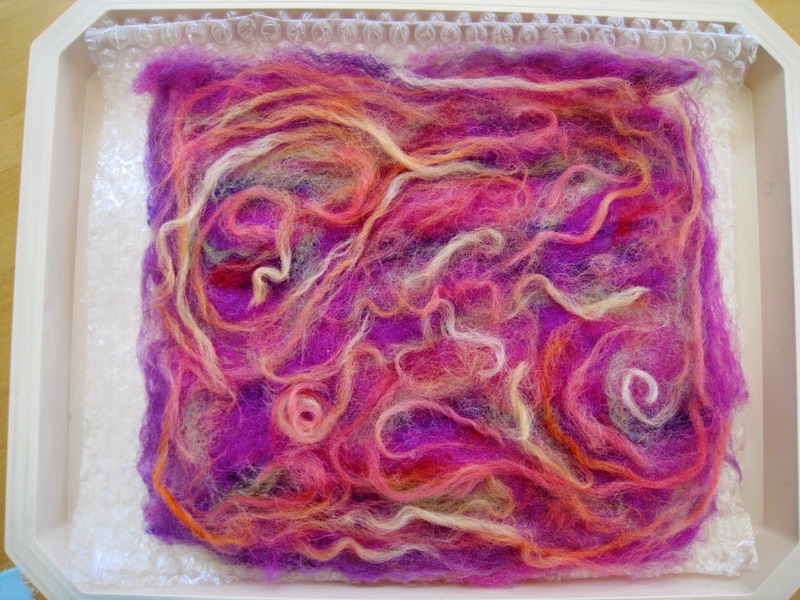 wet felting experiments and has inspired me to do the same. used it only for needle felting. Today I wanted to try wet felting. layered them on the bubble wrap. It felt like I was making lasagna! criss-crossing some colors over the others. I then covered the roving with some lightweight screening material. Next time I do this I'll use tulle or nylon curtain fabric. I sprinkled a little soapy water over the screening. store, with flat-backed glass marbles hot-glued on. ten minutes, checking once in a while to see whether the wool was felting. rinsed it and laid it out on a towel. My next felted pieces will probably be thicker, but for now I'm happy. I'd like to add beading and embroidery to these. We'll see what develops!! casserole when you are in need. not to bother Helen on Wednesday nights. in the back of Zeke's Auto Body Shop. There they play a few hands of poker. I'm half jokingly calling this month my Summer Art Retreat. I think summer is beautiful, but heat and humidity drain my energy in a big way. 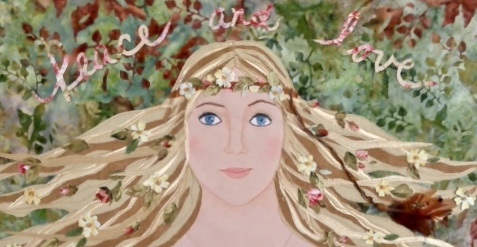 Since my home is air conditioned and I have a light filled porch to work in, I've decided to stay indoors as much as possible and do what I love to do - make art! Today I spread out my papers, scissors, paints, markers, etc. and began working on my much neglected "fictional characters" which I'm now dubbing my "Cast of Characters". If you're not familiar with them, you can find some here. I'm trying to find a way of depicting them that is both whimsical and not too difficult to execute. I love making up little stories about them and I've always loved drawing faces, so they are a good fit for me. I love doing cut paper, but today taught me that cutting out this many leaves is way too time consuming! 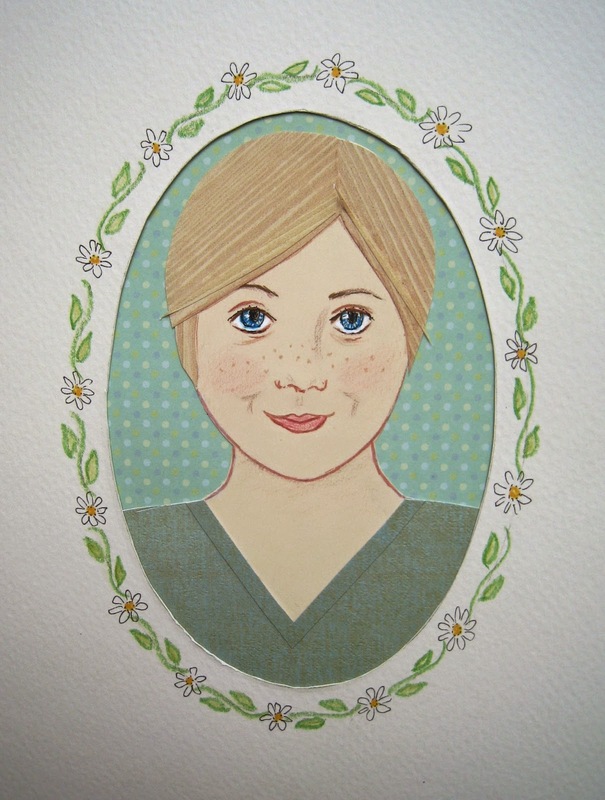 The floating heads are some ladies I'm working on - there are many heads floating around my house! When I went out to get the mail, I saw that my hydrangeas are starting to bloom and I cut just one. 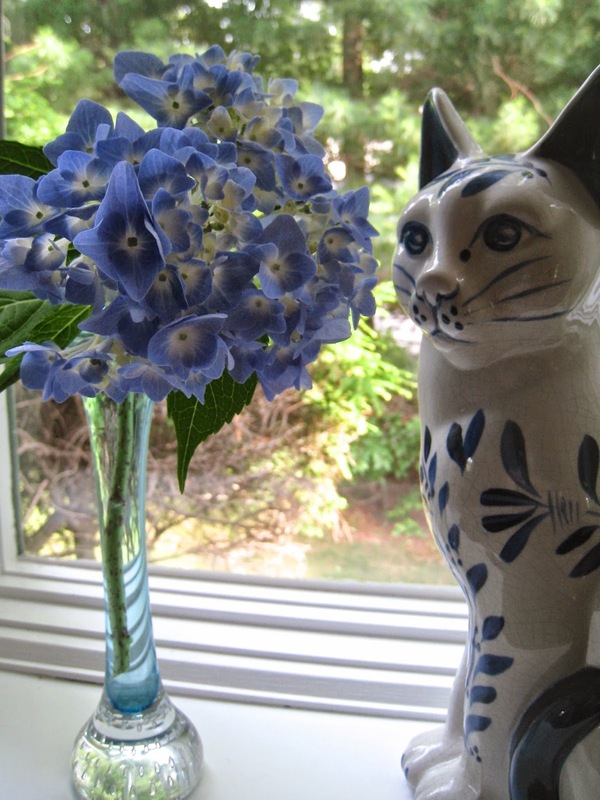 It looks so pretty beside my Dedham Pottery cat! I've had a wonderful day and hope you have, too!